Wheel Of Fortune: Is This The Greatest Guess In The Show's History? Wheel of Fortune has hosted plenty of good and totally godawful contestants over the years, but I’m not sure any of them have been as unpredictable or exciting as the big winner this week. Check out this amazing Wheel of Fortune contestant who was able to get an answer after guessing just one letter. Wheel of Fortune is one of the simplest TV game shows out there. Contestants are given a category and then take turns spinning a wheel and guessing letters worth a certain monetary amount. This time around, the category was “character.” It was contestant Matt DeSanto’s turn to guess the three-word answer. 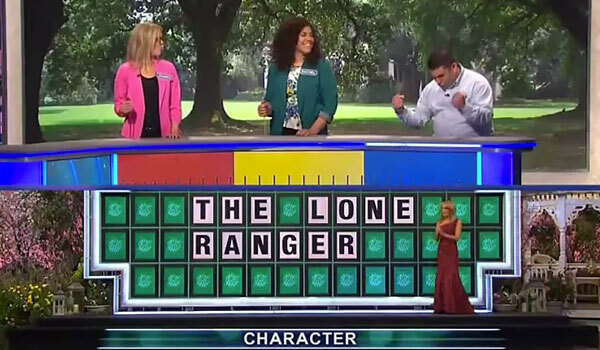 He took a look at the board, guessed an “e” and then blurted out “The Lone Ranger” after Vanna White flipped around one of the three e's in the puzzle. Talk about intuition. Obviously, that’s not a bad guess, since all of the letters fit the puzzle, but he still looked pretty triumphant when all of the letters fit. While it was pretty lucky that the answer worked out, DeSanto’s clearly an excellent Wheel of Fortune player. He’s not the kind of guy who is going to holler out random guesses that don’t even particularly makes sense, like the contestants who kept guessing horse-related answers earlier this year. He’s also nothing like the extremely incompetent college student who guessed “On the spot dicespin” instead of “on the spot decision” with most of the letters on the board. That spot-on guess proves DeSanto is an excellent Wheel of Fortune player, but it gets better. The young man, who also happened to have a crush on Vanna White, actually took home a whopping $91,892 in prize money during the episode. In 39 years, we’ve seen people win more money, thanks to the million dollar bonus prize that was instituted in 2008 and was won by contestant Sarah Manchester just three months ago. Still in a series where most winners go home with just a few thousand dollars, DeSanto’s win is certainly a big one. In fact, he’s the first person to win more than $70,000 before heading into the bonus round. While DeSanto's awesome guess is one of the best moments we've ever seen on Wheel of Fortune--if not the best--great and amusing moments happen on game shows all the time. If you need a few more game show fixes this morning, check out the kids who failed spectacularly at math on Jeopardy recently or the older gentleman who made a dirty guess on Family Feud.